The Machine is equipped with screw operating, self centralising expanding mandrel, manually operated by a built in adjusting handle. Leveraging on our vast acquaintance of this area, we are involved in providing a varied range of Automatic Spring Testing Machine. DSK manufactures grinding machines considering the vital aspect of grinding process. The E1 & E2 critical parameters are considered controlling the machine parameter very closely. 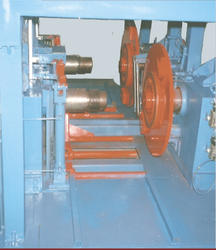 We are the oldest manufacturers and suppliers of CNC Spring Coiling Machines. These types of machines are available with different specifications and can be customized according to the specific requirements of customers. CNC Spring Forming Machines Over the years - DAS PMT has been manufacturing CNC Spring Forming Machines. - These are fully automatic machines ideal for mass production of left and right hand coiled springs. Compression springs with cylindrical, single and double conical springs can be manufactured on two-finger system provided. - High quality production, multi-shift can be achieved on these machines.